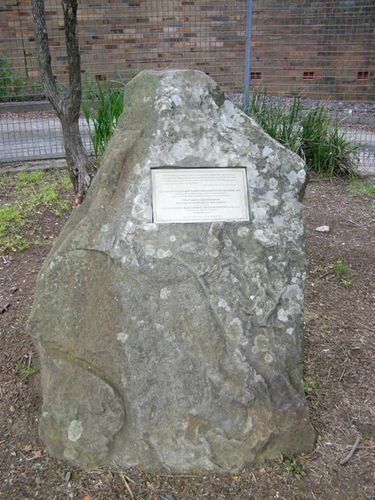 Plaque commemorates the 175th anniversary of the naming of Springwood by Governor Macquarie in 1815. "We then Halted at three O'Clock in a very pretty wooded Plain near a Spring of very good fresh Water and Pitched our tents near the side of the Road. This Stage is 12 Miles from Emu Ford and our first on the Mountains - The Place being very pretty I have named it "Spring - Wood "
Governor Macquarie named Springwood on 26th April, 1815 when he camped overnight in the area on the first day of his journey to inspect the Western Road, completed by William Cox three months earlier. Committee of Springwood 175th Commemoration Inc.